The contemporary installation PROSPETTIVA, which celebrates the European Capital of Culture title, was inaugurated this evening, at the foot of Ġlormu Cassar Avenue in Valletta (close to St James ditch). 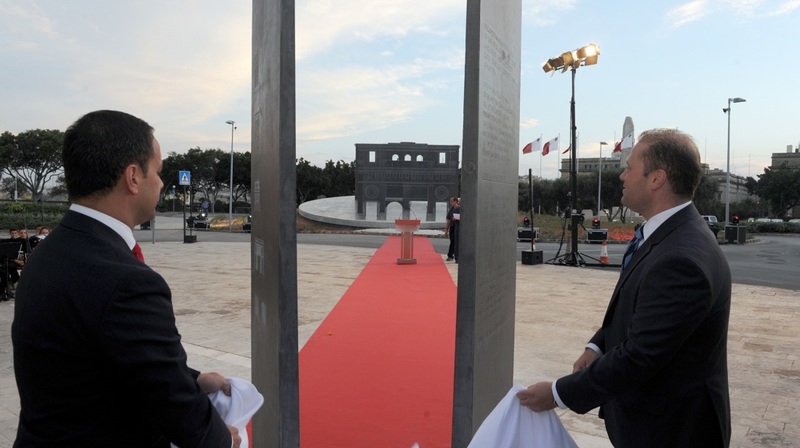 During the inauguration, which was presided over by Prime Minister Joseph Muscat, Valletta 2018 Foundation Chairman Jason Micallef said: “PROSPETTIVA is a contemporary installation narrating the story of the capital Valletta by reminding us about the past, speaking about the present and looking to the future. This is a symbol of how Valletta 2018 intends to make art accessible to the public”. The aim of the project is to celebrate the European Capital of Culture title while providing the best of Maltese contemporary design, architecture and public art with a platform, upon which it can be enjoyed by both local and international visitors to the capital city. Over the past year-and-a-half, the Valletta 2018 Foundation has worked relentlessly with its partners, in pooling resources for the regeneration of Valletta. Consequently, the city is being transformed into a vibrant home to artistic, residential and business communities. One of the main aims of the Valletta 2018 Foundation is to increase access to culture in Malta and, as a result, nurture participation within the arts. Coordinated efforts are taking place together with other cultural organisations for art to be present in many places and different communities in Malta and Gozo, as frequently as possible. By 2018, the Foundation aims to see the largest possible public participation in the arts and culture. In Chris Briffa’s words, Valletta is a collection of eras, a summation of times on which layers of architecture pay homage to its stylistic preoccupations and ambitions. PROSPETTIVA seeks to revisit the memories of one of Valletta’s most iconic and controversial sites – Bieb il-Belt – by means of an architectural performance engaging in perspective and apparition. The five historic gates were studied, drafted and reinterpreted into a singular 2D icon; which was subsequently disassembled into different planes and anamporphic projections. The installation by Chris Briffa Architects was chosen by a jury composed of Prof. Richard England, Rupert Cefai and Carlo Schembri.